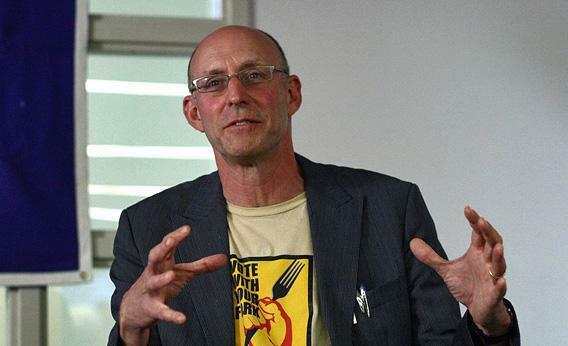 Michael Pollan on agriculture’s role in fighting climate change. Michael Pollan on how changing agriculture could reverse climate change. American science journalist and author Michael Pollan, speaking at a Yale University “Masters Tea”, April 2008. Eating meat is bad for the planet, right? That hamburger you’re contemplating for lunch comes from a cow that, most likely, was raised within the industrial agriculture system. Which means it was fed huge amounts of corn that was grown with the help of petroleum, the carbon-based substance that has helped drive Earth’s climate to the breaking point. In industrial agriculture, petroleum is not only burned to power tractors and other machinery used to plant, harvest, and process corn—it’s also a key ingredient in the fertilizer employed to maximize yields. Perhaps no one has been more influential in popularizing the environmental critique of industrial agriculture than Michael Pollan. His 2006 best-seller, The Omnivore’s Dilemma, revealed how corporate profits, misguided government policies, and an emphasis on convenience have given Americans food that is cheap but alarmingly unhealthy for those who eat it, not to mention the soil, air, and water relied upon to produce it. These days, however, Pollan is delivering a deeper yet more upbeat message, one he shared in an interview while promoting his new book, Cooked: A Natural History of Transformation. (Disclosure: Pollan and I have been friendly colleagues since we met at Harper’s in the early 1990s, when he was executive editor.) Now, instead of just exposing the faults of the industrial agricultural system, Pollan is suggesting radical new ways to make agriculture work for both people and the planet. With the right kind of technology, Pollan believes that eating meat can actually be good for the planet. That’s right: Raising livestock, if done properly, can reduce global warming. That’s just one element of a paradigm shift that Pollan and other experts, including Dennis Garrity, the former director general of the World Agroforestry Center in Nairobi, Kenya, and Hans Herren of the Millennium Institute in Washington, D.C., are promoting. They believe that new agricultural methods wouldn’t just reduce the volume of heat-trapping gases emitted by our civilization—they would also, and more importantly, draw down the total amount of those gases that are already in the atmosphere. “Depending on how you farm, your farm is either sequestering or releasing carbon,” says Pollan. Currently, the vast majority of farms, in the United States and around the world, are releasing carbon—mainly through fertilizer and fossil fuel applications but also by plowing before planting. “As soon as you plow, you’re releasing carbon,” Pollan says, because exposing soil allows the carbon stored there to escape into the atmosphere. One method of avoiding carbon release is no-till farming: Instead of plowing, a tractor inserts seeds into the ground with a small drill, leaving the earth basically undisturbed. But in addition to minimizing the release of carbon, a reformed agriculture system could also sequester carbon, extracting it from the atmosphere and storing it—especially in soil but also in plants—so it can’t contribute to global warming. Sequestering carbon is a form of geoengineering, a term that covers a range of human interventions in the climate system aimed at limiting global warming. It’s a field that is attracting growing attention as climate change accelerates in the face of continued political inaction. Last month, the amount of carbon dioxide in the atmosphere passed 400 parts per million, its highest level since the Pliocene Epoch 2.6 million years ago (when a warmer planet boasted sea levels 30 feet higher than today’s—high enough to submerge most of the world’s coastal capitals). Meanwhile, human activities, from driving gas-guzzlers to burning coal to leveling forests, are increasing this 400 ppm by roughly 2 ppm a year. The case for geoengineering begins with the recognition that the most widely discussed “solutions” to global warming—such as riding a bike rather than driving a car and making electricity from wind rather than natural gas—address only the 2 ppm part of the problem while leaving the 400 ppm part untouched. To be sure, reducing the 2 ppm of annual emissions growth is absolutely necessary—it just doesn’t go far enough. At 400 ppm, global warming is already contributing to a mounting litany of record-breaking weather. In the last year, the United States alone has suffered its hottest summer on record, its worst drought in 50 years, and the largest Atlantic hurricane on record, Superstorm Sandy. Globally, the list of climate-related extreme weather events is much longer. According to Pollan, photosynthesis is “the best geoengineering method we have.” It’s also a markedly different method than most of the geoengineering schemes thus far under discussion—like erecting giant mirrors in space or spraying vast amounts of aerosols into the stratosphere to block the sun’s energy from reaching Earth. Whether any of these sci-fi ideas would actually work is, to put it mildly, uncertain—not to mention the potential detrimental effects they could have. Some, but not all, of Pollan’s analysis here resembles the holistic management of grasslands advocated by Allan Savory, a biologist from Zimbabwe whose TED talk earlier this year provoked widespread interest. Savory has his critics, though, including James McWilliams, a historian at Texas State University, who wrote in Slate that the most comprehensive scholarly analyses of holistic grazing found that it did not improve plant growth or, by implication, carbon sequestration. Savory and his allies argue that the studies cited by McWilliams did not follow his prescribed methods of holistic management and thus prove nothing about it. Also in Future Tense’s July series on agriculture and climate change: David Biello examines why so many farmers don’t believe in climate change, and Frederick Kaufman explores the potential of open-source GMOs.